New Lantern Design From Tim Ramzyk of Pulp Novelties! Wow! 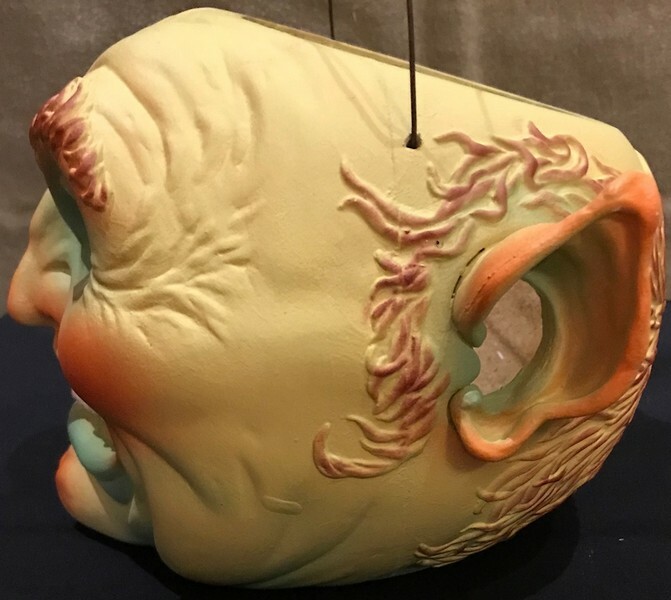 I just received Tim Ramzyk's 2018 Halloween pulp lantern, The Goblin, and LOVE it! As you know, it is rare that I tout anything but vintage items on this blog, but take a look at this captivating and unsettling lantern. Tim is a Wisconsin-based artist who meticulously and painstakingly hand molds his own designs from a heavy, durable material. Including this year's true treat, The Goblin ($120), he has 6 designs in limited quantities at price points that are in a few words, way too cheap! The other designs are Nosferatu the Vampire ($120), The Witch ($110), The Skull ($110), The JOL ($90) and The Black Cat ($90). He has just a handful of The Black Cat left. Tim tells me that once they're gone the design will be retired. For those who know me, you know that I rarely buy anything Halloween unless it is vintage. I've made an exception - and you should too. Snap these up before they are ALL GONE by contacting Tim directly at pulpnovelties@aol.com. He began listing his awesome creations yesterday on Etsy. Tim tells me that he plans to sell any and all Halloween designs only through the third week in October, or until his castings for this year are depleted, whichever comes first.